A Google employee has recently said that search engines have improved so much that people are surprised when they don't get good results. When Google has been launched, users were really surprised to see relevant results, even if they were much poorer than they are today. 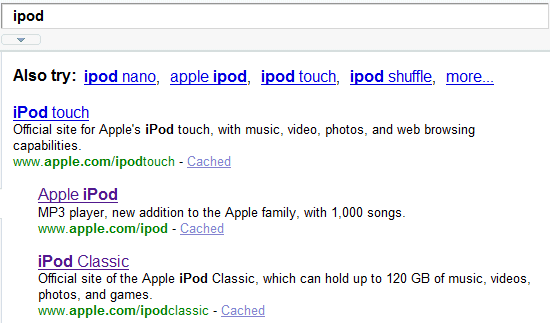 When you search for [iPod], you expect that the first result is iPod's homepage. Google returns a different page (iTunes homepage) and doesn't even include the iPod homepage in the list of the top 10 search results. Bing and Yahoo Search return much better results: iPod's homepage is the top result in Bing and the second result in Yahoo Search. The most likely explanation why Google doesn't return the most relevant results is that apple.com/ipod used to redirect to apple.com/itunes, as you can see if you check Internet Archive. The most recent version of the page cached by the Internet Archive is from October 2009 and it still redirected to the iTunes homepage. I just did a search with Google and the iPod Classic page (http://www.apple.com/ipodclassic/) was the second listing after iTunes. The iPod section of the Apple Store page was in the top 10 also. So perhaps Google should add a feature to let us googlers say "But that's not what I wanted". Maybe using Chrome and Google Search History you could remember search before last and if we land on a non google page from our next similar search as "Is this the page you wanted to start with?". I know that I would be glad to help improve Google's search results! it turnes my query into an akronim and then searches for something COMPLETELY different, my query isnt even on the first page! In Germany Bing also returns the iTune stores as the first result. You need to fire your research team. These are two completely different websites. Lately I've been extremely frustrated with all the spam in Google search results. So many fly-by-night companies have figured out ways to game the ranking system. Finding something useful has become like searching for a needle in a haystack. I have to first enter in a reasonable search and then scan the page looking for all the terms obviously related to spam. Then I have to modify the query with negated terms to filter out the trash. Google needs to find some way to analyze their data to identify these spammers and relegate them to the back of the results. Google search results are getting worse, more and more spam sites appearing high up in the SERPs. Google doesnt seem to be as good as Bing in detecting multiple interlinked sites owned by the same individuals/businesses, so making it easy to spam Google's SERPs. Result is number one spot for main site and spamming the rest of Google's SERPs with the microsites. "You need to fire your research team. These are two completely different websites. " They are subfolders on the SAME website ! Further there are no redirects for these URLs. Polish for "the grading system" or "the present rating system"
Now isnt that a good example of how Google results are losing their relevance, compared to Bing's results ? I guess Google are changing their algos so often (up to four hundred times a year apparently) that even those inside Google don't fully know understand how they work anymore and why they are getting worse ? I still think that you will find that folks will gravitate towards Google over the other search engines. Sure, Bing is getting notoriety at the moment but when the average person needs to do a search, they are going to Google. google search results have deteriorated excessively (and maddeningly) over the past 2 years, especially this last year. A New Social Google Service?